You have also received an email with your Booking ID and a Password, so that you can login to My Booking area on our website and check your booking's status. Right now we are checking availability, please hold a few minutes. You will be emailed once confirmation arrives, so you can pay your reservation caution. If you have any further questions please email us at contact@surfinn.pt. Thank you for choosing Surfinn! Welcome! Making a reservation is simple, just follow the instructions given in the form. Notice that every field has to be completed to be able to continue. Stop surfing on the same place again and again! There are plenty more surf spots and surf schools out there. Go for it! Embrace the true surf spirit and go surfing all along the coast. There's nothing like surfing a different wave everyday! 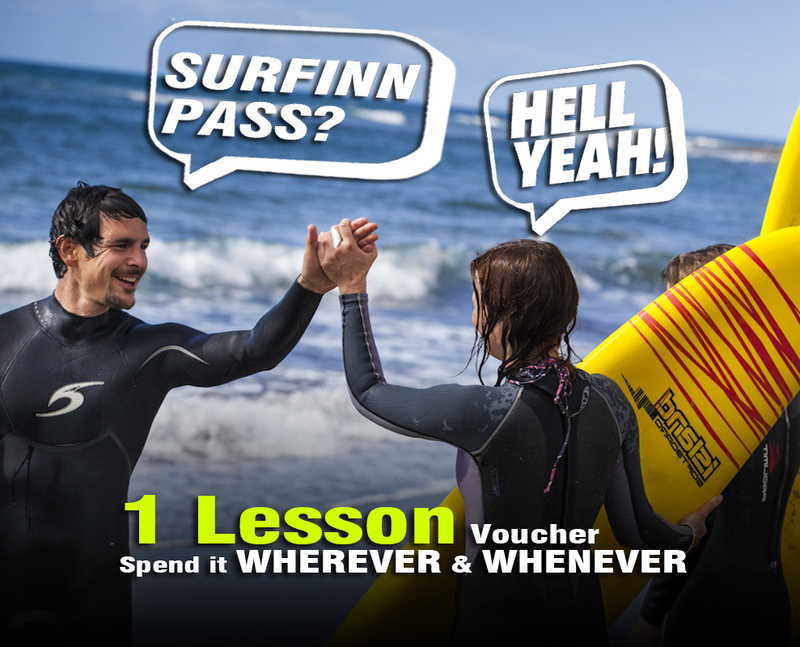 Surfinn made it easier for you and created the Surfinn Pass, a surf lessons voucher that you can use in dozens of surf schools along the coast always at the same prices. Finally it's possible to buy a cheaper pack of Lessons and spend it WHEREVER and WHENEVER you want! HOW TO USE THIS VOUCHER? 1 - Buy the pack you want (1, 5 or 10 Lessons) 2 - Choose your Surf School 3 - Book directly with the School mentioning your Booking ID code ... and that's it! Those lessons will be credited in your Voucher. You can now buy a cheaper pack of Lessons and spend it WHEREVER and WHENEVER you want! CONDITIONS: - Because surf lessons are subject to a maximum number of students and favourable natural conditions, reservations should be made in advance. For reservations, please email or contact each surf school directly. For information about the Surfinn Voucher Programme, please email surfschools@surfinn.pt or call +351 91 735 14 35. - Due to logistics and organisation of the surf lessons, any cancellation not reported until 18h00 (6 pm) the day before, the class will be counted as if the student had attended, regardless the reason that led to his cancellation. - Packages are not personal and can be shared by several students. - The purchase of Lessons Packs (1, 5, or 10) is only available online, on this website! - All equipment (wetsuit and board) is included during the lessons. - All schools adherent to the Surfinn Voucher Programme and Instructors are duly registered and accredited by the Portuguese Surfing Federation. - All purchased Lessons Packs (1, 5, or 10) are valid for one year and may be used only at the surf schools adherent to the Surfinn Voucher Programme. Please provide us the following personal information if you wish to continue with your booking. Please make sure that the following information is correct. Then continue to check availability and finish your reservation. SURFINN © 19-04-2019 02:47:54. ALL RIGHTS RESERVED.